Falcon and Pointer, which had its MOJ licence revoked by the Claims Management Regulator in January 2016, told the Information Commissioners Office (ICO) that it had stopped making automated calls in June 2015. However, an investigation discovered that it continued to make a further two million automated calls during July and August 2015. 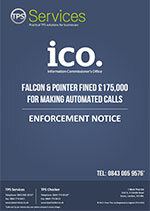 Some of these automated calls were made in the early hours of the morning demonstrating a complete lack of control by either Falcon & Pointer themselves or their supplier. In all likelihood, the supplier was based overseas and submitted the automated calls to be sent during the wrong time zone, which resulted in calls being received by consumers at all hours of the day and night. The company said the calls were made by a third party firm that provided the data and who had informed them that the data had been screened for consent and/or TPS, however, Falcon & Pointer failed to check that this was actually the case. That was a serious misjudgement. “Firstly, if you’re going to undertake automated broadcasting such as text or voice, then rest assured that if you make the mistake of scheduling these broadcasts for the early hours of the morning then you’re simply handing the ICO an invitation to investigate your company and issue a fine. Secondly, if you’re going to leave your TPS screening with your supplier on nothing more than trust, the regulators simply won’t accept that as an adequate response.”. Are you a business looking to screen data against the TPS,CTPS & FPS? Want to know just how many numbers in your database are actually on the TPS and CTPS?